Fly from Dublin to Rome and explore the Eternal City for less with Aer Lingus. Once the home of the all-conquering Roman Empire, the Italian capital is one of the most visited cities in the world, thanks to its ancient history and world- famous attractions. From the majestic Colosseum to the Pope's official residence in the Vatican City, the city positively oozes charm and culture. 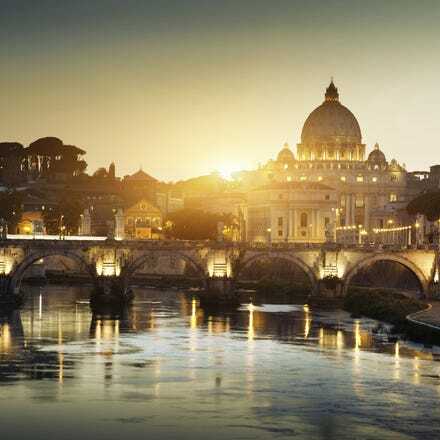 Book flights from Dublin to Rome with Aer Lingus today and discover this fascinating city for yourself. 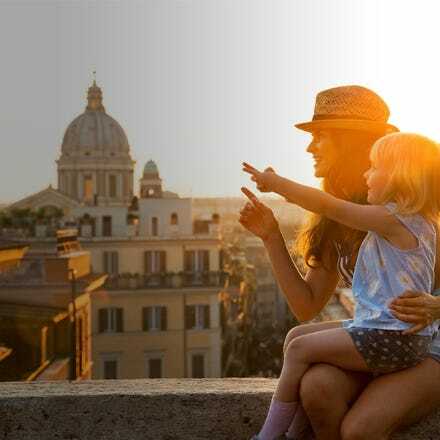 Travelling to Rome is cheap and hassle-free when you fly with Aer Lingus. Choose a convenient flight time to get to Leonardo Da Vinci Airport from Dublin. Rome, known as the Eternal City, has attracted visitors for over 2,000 years. It is one of the most magnificent and romantic cities in the world. Rome has an attractive mix of grandiose sights and bustling city life. Life is sweet, the cake is there for the eating. Italian designer shopping, smooth ice cream, frothy cappuccino and exquisite wines to name but a few things that await you on your visit to Rome. Rome is a city brimming with history, delicious food and beautiful sights, making it the ideal destination for a relaxed weekend break. Fiumicino Airport – also known as Leonardo da Vinci Airport – is the main airport for Rome. It is located in the town of Fiumicino, about 30 kilometres (18.5 miles) from the centre of Rome. This is the airport you will arrive at when you fly with Aer Lingus. Rome also has a second airport, Ciampino, located about 12 kilometres (around seven miles) southeast of the city centre. This airport is mainly served by low cost airlines and package tour groups. There are several ways you can get from Leonardo da Vinci Airport to Rome's city centre. For example, the Leonardo Express train runs directly from Fiumicino to Roma Termini station, the city's main railway station. The service departs every half hour in each direction, and tickets can be purchased from the self-service machines, travel agencies, ticket desks or online. You can also take a regular, non-direct train service from the airport to Termini station. Another option is to take the Terravision Shuttle Bus, which also links the airport to Termini station. The journey takes approximately 55 minutes, and you can either book tickets online in advance, or buy them at the Terravision desk or bus stop at the airport. Some of the low cost airlines operate their own bus services, and you can also get regular city buses from nearby Anagnina station. Finally, you can also take the Metro train FM1 if you're heading from Fiumicino Airport to more far-flung areas such as Fara Sabina, Orte and Poggio Mirteto – although note that the Metro does not stop at Termini station. Alternately, a taxi journey from the airport to the centre of Rome takes about 20 minutes (see "Taxis", below). Rome's public transportation system is centred on Roma Termini station, which is handy for visitors arriving in the city by rail or from the airport. The Italian capital is served by an extensive network of local buses and streetcars run by the company ATAC. You can buy ATAC travel passes which are valid for 1, 3 or 7 days on all public transportation in the city, including the Metro and most regional train services. Tickets can be purchased from ATAC ticket machines, newsagents or ticket outlets on the underground. For nighttime travel, the Metro runs until midnight. Night buses stop at stops marked "N". Taxi ranks can be found throughout the city centre, but it is cheaper to hail a taxi in the street than to pick one up at a stand or order one by phone. Tourists are recommended to only use the licensed yellow and white taxis.